← Truckers strike in China wins demand for lower fees. 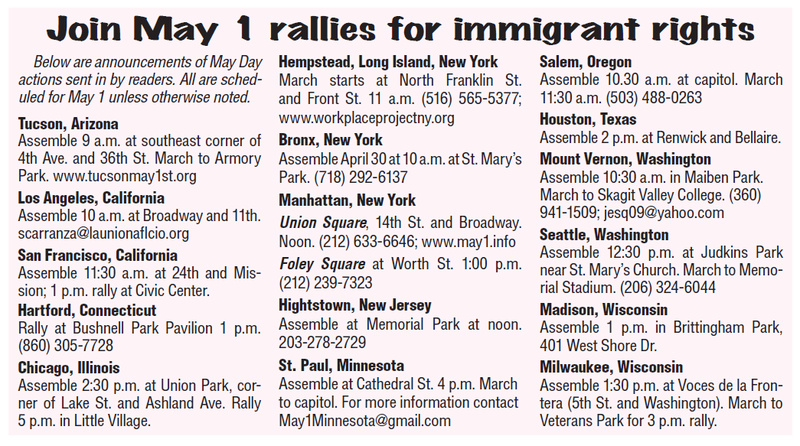 May Day (May 1) rallies have been called in many cities throughout the United States in continuance of a tradition that was reignited following the massive May 1 march for the rights of immigrant workers in 2006. These rallies are called in the context of ongoing attacks on the social and human rights of the over 10 million undocumented workers who are employed in the US economy and also in the context of a militant struggle that has been waged by working people to defend against pointed attacks on the incomes and trade union rights of workers in the public sector of the US economy. According to The Militant Newspaper The actions in Milwaukee Wisconsin and Los Angeles have the official sanction of the AFL-CIO the primary national trades union organization in the United States. See below for locations and schedules of these actions. This entry was posted in Migrant Labor, political mobilizations. Bookmark the permalink.